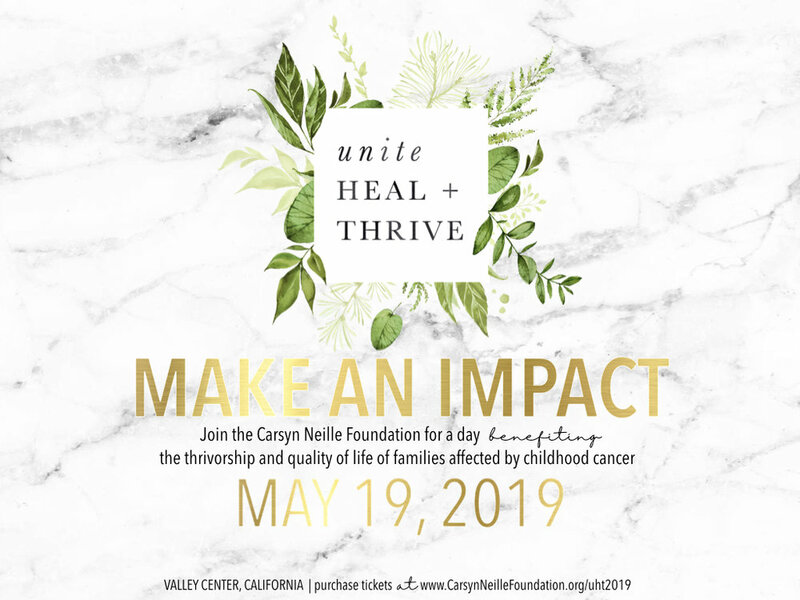 On Sunday, May 19th, the Carsyn Neille Foundation will be hosting the 3rd Annual Unite, Heal + Thrive, a community fundraising event including a lunch and auction. This year’s event will be hosted at a private residence*, known as the Steele Ranch, a 5 acre avocado ranch nestled in a gated community in the foothills between Valley Center and Escondido. The event will include interactive Heal + Thrive stations, a farm to fork dining experience provided by EAT Marketplace, entertainment, silent auctions and raise the paddle. Our goal is to raise funds to serve and contribute to the quality of life of childhood cancer families with our Rooms to Heal by Carsyn Neille, Rooms to Thrive™️ and Comfort Kit programs. Join us for this unique experience that unites our community of Comfort Creators, collaborators and the families we love for a magical time and philanthropy.